I started our Thanksgiving dinner prep yesterday. For me, the anticipation is the most exciting part. I love prep work and organizing every single step on a piece of paper and in my head. 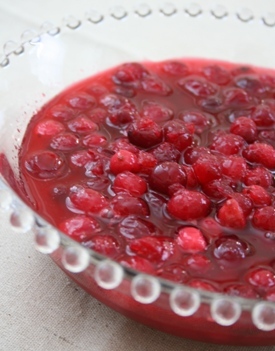 I made this cranberry sauce. I pretty much followed the recipe from my cooking class, but with a few minor modifications. So easy to make but absolutely delicious! Well, I'd better get back to the kitchen. I still need do some more prep work before going to bed. It is going to be a blast tomorrow!